A bombshell reverberated across the internet two weeks ago, leaving many a comic book fan shaken and stunned. If you haven’t already heard, DC Comics is giving its entire line of comics an extreme makeover. Essentially, they are renumbering all of their titles with a brand new No. 1, redesigning most of their characters’ costumes, skewing them younger in age and streamlining their decades of continuity. And now all of their books will be available for digital download via app on the same day they are released in print. All of this is in the pursuit of introducing a younger generation to their characters and pushing a new crowd to pick-up/download their books. But die-hard long-time comic book readers are a notoriously finicky and critical lot, and not surprisingly, many fanboys are already drawing lines in the sand and taking sides, voicing their opinions (quite venomously, in some instances). Watching all of this play out, my attitude has mostly hovered somewhere between light trepidation and curious interest, a kind of “wait and see” approach to it all. But I do understand DC’s motivation. The comic book publishing industry is currently faced with numerous challenges. The down-turn in the economy has impacted sales. The world is moving away from printed paper to digital touch-screens. A bold new approach is necessary to counter this decline before it is too late to recover. Odds are, unless you are a regular comic book reader yourself, this announcement has flown completely under your radar and has no impact on you. But I bring it to your attention for a reason. As I began to sift through the corporate hype and nerd rants, I couldn’t help but pick up on a fascinating parallel that struck a chord for me as a Christian. Essentially, the purveyors of comics are out proselytizing, seeking to convert the previously unreached masses and introduce them to the world of comics. The more I read about DC’s (and other comic book companies’) attempts to adapt to a changing culture, as well as the passionate observations and critiques made by fandom both for and against this move, the more it vividly resembled many of the approaches taken by the American Church to find its place in the 21st Century and the more it resounded with many of the arguments that have been leveled by Christians on all sides of the debate. It was a far too interesting analogy to pass up, so I decided to develop my thoughts and hone in on these similarities in a series of posts I’m calling Comic Book Evangelism. Let me be clear: my goal in all of this is not to needlessly allegorize and draw comparisons between the comic book industry and the Christian Church just for the sake of excessive and irrelevant symbolism and my own narcissistic gratification. Rather, I genuinely desire continuous spiritual examination, both for myself and for all believers, as we seek to move away from merely going through the religious motions and to instead achieve a heart-consuming fervor for Jesus Christ that will provoke us to make every sacrifice necessary to call people everywhere to repentance and faith in His redemptive Gospel. In the church, we get stuck on so many personal hang-ups that prevent us from carrying out the commission handed down to us and we tend to remain willfully blind to our own unholy motivations. It’s the ol’ “trying to get my neighbor’s splinter while missing my own log” issue that Jesus warned us about. Perhaps by examining the issues faced by a completely non-spiritual enterprise like the production of comic books, a kernel of truth will present itself and challenge our hearts to gain a more balanced biblical perspective on the mission of the church, to discern just what it means to be “in the world” but not “of the world”, and to repent of any previously unrecognized sin. I would encourage you to stick with me here. I am building toward a point that I am trying to make during the course of this series. If you are passionate about Jesus and His church, then I hope and pray these posts would both edify you and stretch you in your faith. And if you are a fellow superhero aficionado, then perhaps this series will force you to abandon some of the extreme fanboy-ish traits that mark you as a prime candidate to manage The Android’s Dungeon & Baseball Card Shop. In him [Jesus] was life, and that life was the light of men. The light shines in the darkness, but the darkness has not understood it. Deep happiness never comes through focusing on yourself. It is the result of living a life centered on God and directed toward others. True joy does not reach its climax in a private communion with God. Rather it reaches its fullest extent only when it is compounded by the joy of seeing others share in it with us. People want the formula, the how to’s of getting the job done. The problem with that approach is that we, the church, are oftentimes giving answers to questions people aren’t even asking. Methods only work when they apply to the context of the people. A declining interest in missions is the sure sign that a church and people have left their first love. Nothing is more indicative of the moral decline of the West than Christians who have lost the passion of Christ for a lost and dying world. 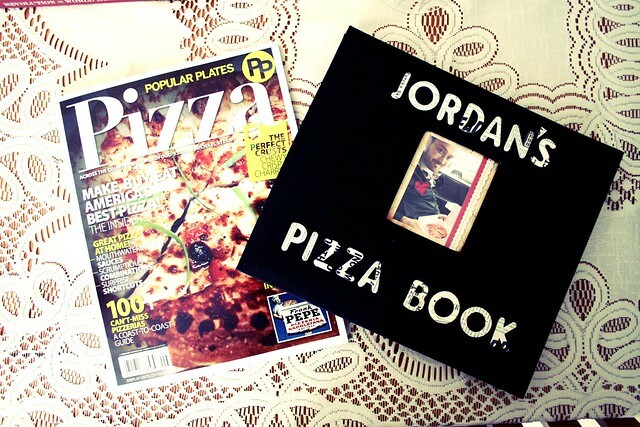 A couple weeks ago, Nikki got me the Pizza Edition of Popular Plates magazine (go pick it up for yourself), which inspired me to set a goal for myself to learn how to make the best homemade pizza imaginable (and I can imagine quite a bit). So after ample supplementary research, I settled on a crust and sauce recipe from the magazine (combined with a few additional tips culled from the internet) and we collected the ingredients necessary for the 2-day process(!) we were about to embark on. 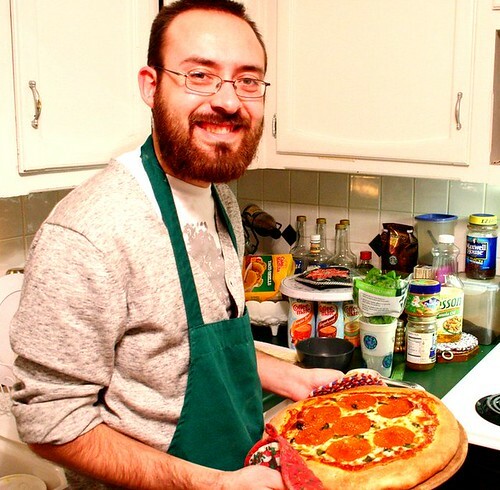 What follows is a pictorial journey through the pizza-making so you can make some fantastic homemade pizza on your own! By the way, I couldn’t have accomplished any of this without the encouragement and cooking prowess of my beautiful wife. 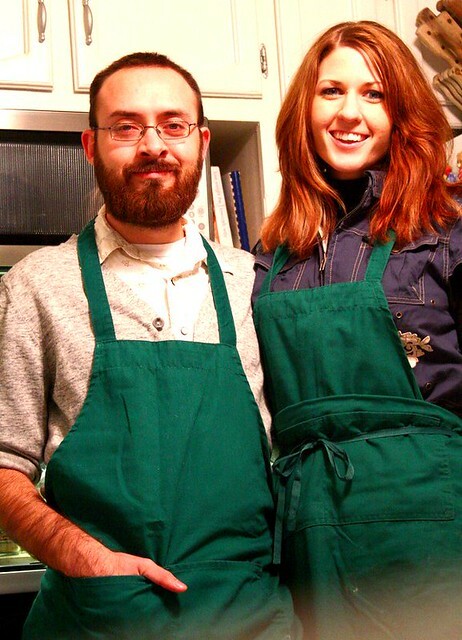 She has been so incredibly supportive of my love for pizza, as evidenced by this post on her blog here, and she made her own pizza along with me that you can see the recipe for here. 1) Dissolve the yeast in ¼ cup of water while you mix the rest of the water in with 2 cups of all-purpose flour and 2 teaspoons of salt. After the yeast is proofed, mix it in with the flour mixture. Stir it well and once it begins to form into a ball, turn it out onto a well-floured surface. Give it a sec to sit there (this is a good time to clean the bowl you were using and coat the sides and bottom with a sufficient amount of olive oil. 2) Dust your hands with flour and knead the dough on the well-floured surface (adding flour as you go whenever the dough becomes sticky). Knead it for 15 minutes, adding the 2 tablespoons of olive oil to the dough mixture while working it well until it is a good silky consistency. Then work it into a ball and place in the bowl, covered loosely with plastic wrap so air can circulate a little. Place it in the refrigerator and let it rise for approximately 24 hours. * Note: This makes enough sauce for 2 pizzas, so if you are just making 1, halve the recipe. Also, it had a bit of a kick to it because of the red pepper flakes, so if you don’t like any spiciness, then leave out that step. 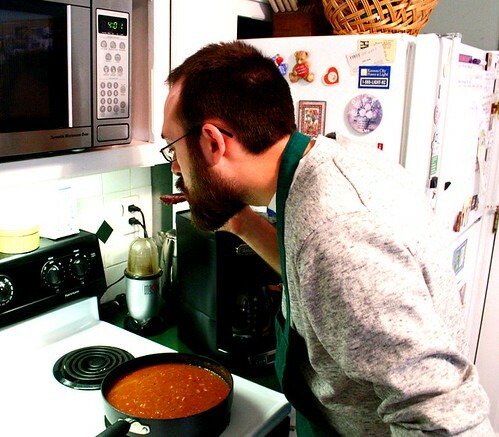 3) Puree the stewed tomatoes (I used a Magic Bullet) and put them in a large saucepan. Add the tomato paste and olive oil and stir together over a medium heat. 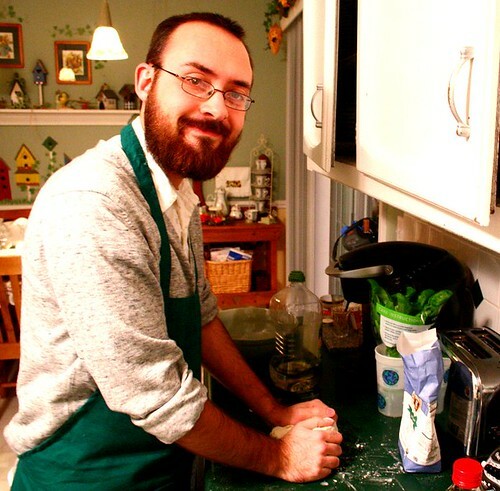 4) Dice the onion and measure out the other ingredients, adding them to the saucepan. Once the mixture begins to boil and splatter, reduce it to a low heat to simmer. Allow it to cook for 3 hours to allow all of the ingredients to really reach peak flavorfulness. The recipe called for 2 cups of water, but we decided that we didn’t want the sauce to turn out too runny. 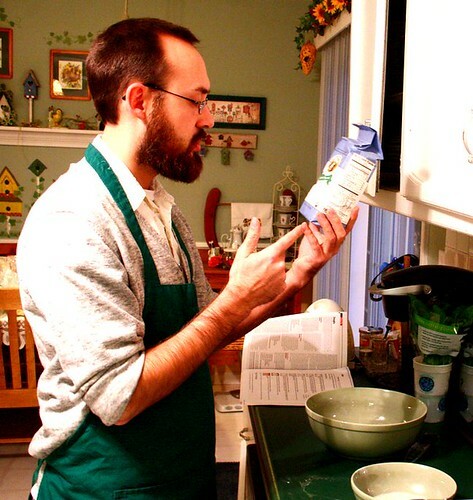 5) Place the dough on a lightly floured surface, punching it down and flattening it with the heel of your palm. 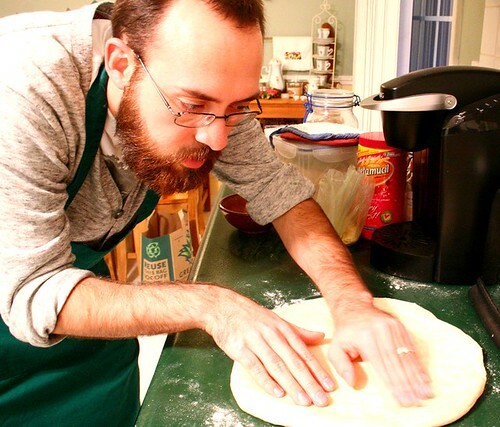 Alternately, lift the dough up and stretch it out carefully, working the dough into a circular disc approximately 15 inches wide. Form the collar of the crust around the edge. 6) Sprinkle the pizza stone with cornmeal and place it in the oven. Preheat to 500° F. Gather all of the toppings you are going to use. 7) Place the butter and the minced garlic in a bowl. Melt in the microwave and mix together into a garlic butter spread. Lightly brush the entire surface of the crust with the spread. Peel the whole clove of garlic, breaking it into small pieces and place on the top of the crust. 8) Once the oven is preheated, use oven mittens to remove the pizza stone and place on the counter on hot pads (I did all of this because I did not have a baker’s peel). Gently place your dough on the pizza stone. Quickly top it with your chosen toppings. For me, this meant first spooning out the sauce to cover the entire pizza up to the crust collar. Then I pulled apart the slices of mozzarella and tore pieces to cover the entire pizza. I added the pepperonis next and then tore the basil leaves into pieces and placed them on top. Lastly I sprinkled the parmesan cheese across the top. 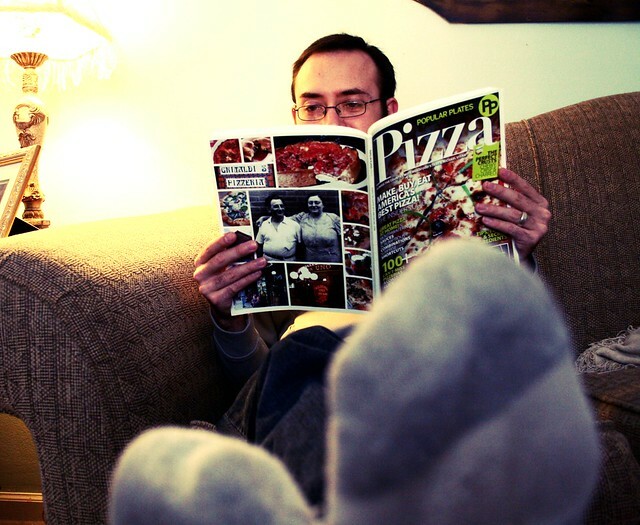 9) Using the oven mittens, place the pizza in the oven and bake for anywhere from 10 to 15 minutes. Keep an eye on it, watching for the crust to turn lightly brown and the cheese to be fully melted and cooked. Remove and cut into slices. Quite frankly, this was the best homemade pizza I have ever tasted. The crust was doughy delicious, the sauce was incredibly flavorful and a little bit spicy, and the toppings were top-notch. It was at least equal to most restaurant pizzas I’ve tasted. It needs a little bit of tinkering to get it right, but someday I will perfect things so it actually exceeds the taste of restaurant pizza (or at least, that is my goal). Give it a try and make some for yourself! Yeah, it is a time commitment, but it will be worth it, I promise. 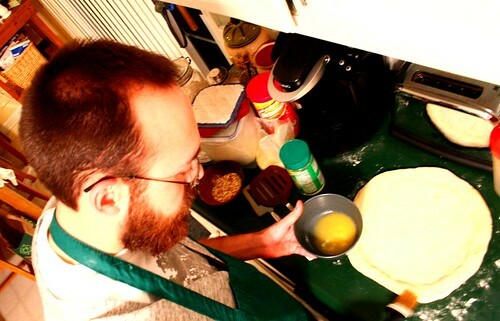 To see an indepth visual look at my pizza-making adventure, check out the photo album below. 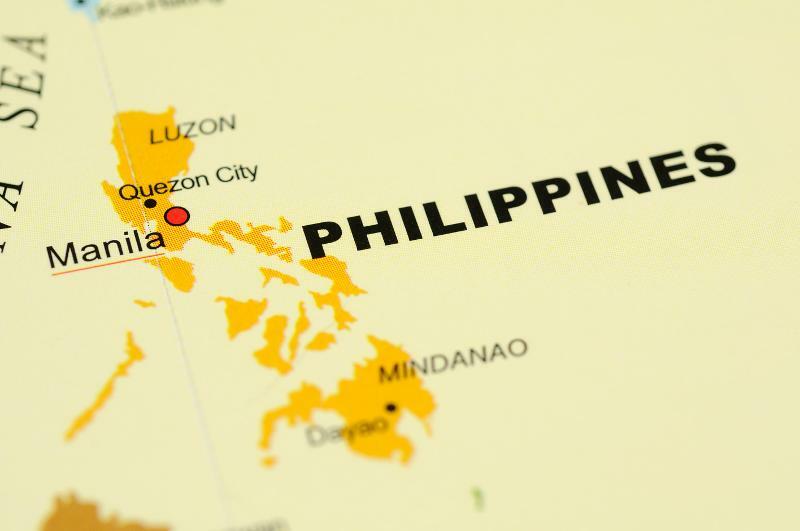 In case you are new to my blog, you might be interested to know that in just a few weeks my wife Nikki and I will be boarding a plane to fly to Manila, Philippines for a few weeks. For the last year and a half, we have been in the process of raising the financial backing to move to the Philippines. Once there, we will be a part of a team of missionaries that are seeking to tremendously impact the 20 million people living in and around Metro Manila with the message of Jesus Christ. 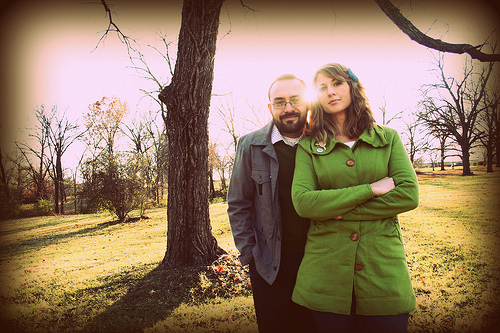 This trip over will be the first step to solidifying the necessary details for us to make the move over this summer. In that regards, the end of our long road of preparation seems almost in view. But we still have some final fund-raising needs to meet before we will be ready to go. That’s where you can help. We are seeking individuals to partner with us with a one-time gift that will enable us to reach our financial goal for serving in the Philippines. If this interests you, please feel free to shoot me an email and I would love to share more about how you can help see God’s name glorified in Manila. I would urge you to check out our website at www.MakeYourMarkInManila.com for greater insight into our ministry and visit this link here to read our latest deputation update and sign up to receive our monthly emails. What would you do if you could change the world? Would you pass up that chance? Or would you jump at the opportunity? So, you say you don’t like comic books, especially superhero comic books? They just aren’t your thing? Maybe you view them as juvenile adventures and adolescent power fantasies? 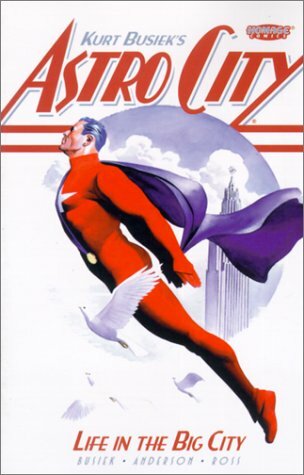 Then Astro City is the book for you. True, it still has super-powered heroes flying around and fighting villainous threats to the general population. But that’s not really the focus here. Kurt Busiek has crafted an imaginative world that is all of his own creation. True, there are analogues for well-known characters from both Marvel and DC, characters resembling either the powers or the personalities of Superman, the Fantastic Four, and Daredevil, to name a few. But these analogues are always fleshed out and examined in a way that you will never see over at the Big Two comic publishers. Busiek has the freedom to do whatever he chooses with these characters because they don’t carry the weight of decades of continuity. But the centerpiece of his storytelling is always the collective human condition. And since no single character is the focus of the series, but rather this entire world, Busiek has the freedom to tell all kinds of stories from ever-shifting perspectives: a reporter learning the impact of journalistic integrity, the secret dreams of a superhero too busy to slow down and live his own life, or the decision of a young girl straddling the line between the world of superheroes and her own familiar ethnic neighborhood. It is really an anthology of storytelling. Brent Anderson brings to the book a very grounded, detailed artistic style that breathes life into the characters. His faces are always extremely expressive and emotive, conveying their thoughts and feelings, their hopes and desires. And he excels in the “ordinary” events of this world just as much as he does in the super-powered aspects. And of course, Alex Ross’ fully painted covers are always a beauty to behold. Especially with this series, with such a heavy focus on ordinary citizens and less on the heroes themselves, Ross diverges from his typical superhero posing in his work and captures some truly unique man-on-the-street perspectives of this fantastical world. This is a collection that demands repeat readings to fully appreciate all of the minute details and expertly crafted narratives. You don’t need an advanced degree in the history of comic books to enjoy this book. Just an active imagination and a love for good stories. If you know me at all, you know that I have a deep-rooted, hunger-fueled, lip-smacking love for pizza. In past posts I’ve compared the Chicago variety and celebrated the week-long national holiday in its honor, as well as hypothesized on the childhood origins of this pizza passion. My wife not only knows this all too well, but is also quite adorably encouraging of my pizza fixation. 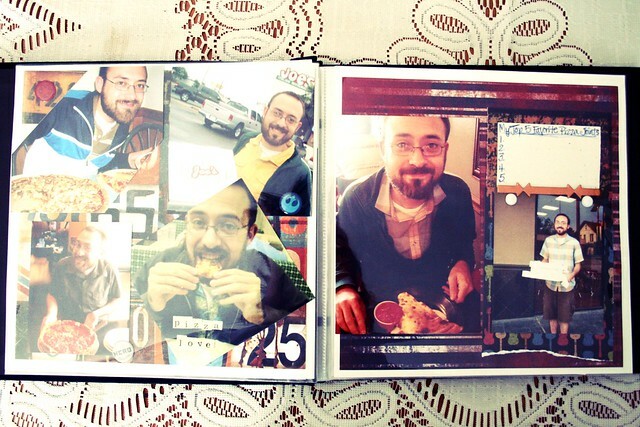 For Christmas she gave me one of the most unique and pleasantly unexpected gifts I’ve ever received: a scrapbook of all the pizza encounters we’ve documented during the course of our relationship (and we’ve documented quite a bit). When we were first dating while living in Springfield, MO, it was my personal goal to visit and rate every single pizzeria in the 417. Nikki not only latched onto this but encouraged me to take photos of my conquests and soon it became a special shared weekly ritual for us to go out and try a new place every Monday on her day off from work. Shortly into our relationship I introduced her to my favorite gorge-fest: the annual Pizza Bowl*. Every year Springfield pizza restaurants would gather for one night to compete with their products. A $10 ticket got you in the door to sample and rate all of the pizza you could eat, and all of the money raised went to combat illiteracy in Greene County. As we embarked on deputation, finding the best renowned pizzerias wherever we went became a fringe benefit to all of our traveling. Nikki quite cleverly compiled all of these photos into one place, with plenty of room for future pizza-related memories to add to this fond look back on past feasts. Is it weird that as I glance through these pages, I can remember every single pizza, every single restaurant, the circumstances and the cities that each took place in? The other pizza-noteworthy mention that coincides with this blog occurred last Friday while we were browsing in Borders. Nikki came across the perfect magazine for me! The perfect companion to my pizza scrapbook, this quarterly publication has it all: a history of pizza development; a thorough examination of all the different styles of pizza, crusts, sauces, and regional flavor flair; a listing of the Top 50 pizzerias of every region of the U.S.; and cooking tips and recipes to help make the best homemade pizza possible. That last one interests me the most. In preparing to move to the Philippines, I know from personal experience that my pizza options are limited. Sure they’ve got Shakey’s and Pizza Hut, both of which are fine pizza institutions dating back to the 1950’s (although I’ve personally never had the opportunity to try Shakey’s outside of the Philippines), and they are good. True, there’s a Sbarro’s in Mega-Mall, a perfectly good mall pizza option, although I’ve heard past horror stories from the Lyons family concerning that particular eatery that might make me steer clear. And yes, they even have California Pizza Kitchen at the Shangri-La Mall, which is probably the best-tasting option for great pizza that I’ve come across in Manila. But all of that lacks the charm and that unique, individualized flavor that only a local homespun pizzeria possesses, the likes of which can be found all across our nation. 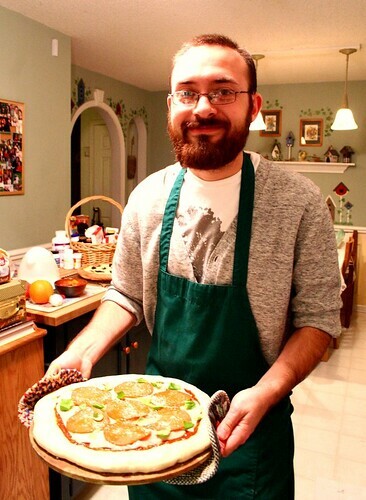 So I have a personal goal to learn how to make fantastic homemade pizza the likes of which will rival any pizzeria. In so doing, I will be able to pass along my love for pizza to my children one day. I can’t wait to give some of these recipes a whirl and experiment on making the perfect homemade pizza. I will be sure to keep you updated on that endeavor. * In fact, even as I wrote this I realized that tonight, Jan. 27th**, the Pizza Bowl was currently in progress in Springfield and I had nothing here in KC preventing me from driving down and celebrating with a handful of pizza. I can’t express how much I wish this realization had dawned on me 6 hours earlier. ** Correction: the Pizza Bowl will be on Feb. 2nd this year, so I still have time to make arrangements to be there. If you live in Springfield, I highly recommend you check it out as well. Faster than a speeding bullet. More powerful than a locomotive. Able to leap tall buildings in a single bound. You know the spiel. He is known the world over and his logo is arguably the most iconic symbol of the 20th century. 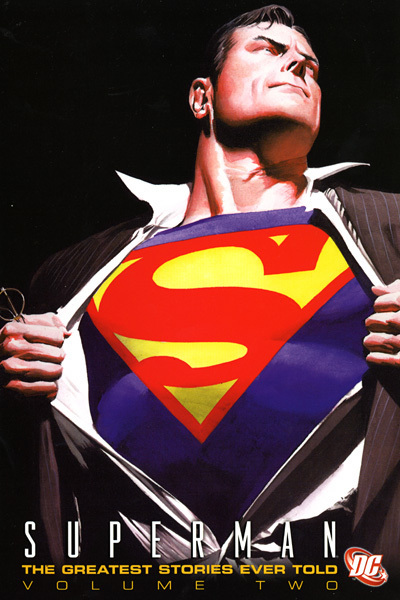 He’s Superman. Rocketed to our planet as a child from a dying world and launched into the collective consciousness through the powerful imagery of comic book artwork. The visual representation of Superman is the focus of this book that I snagged from the Hutchinson Public Library earlier this fall. It was a quick read (more visually stimulating than informative) but quite enjoyable. 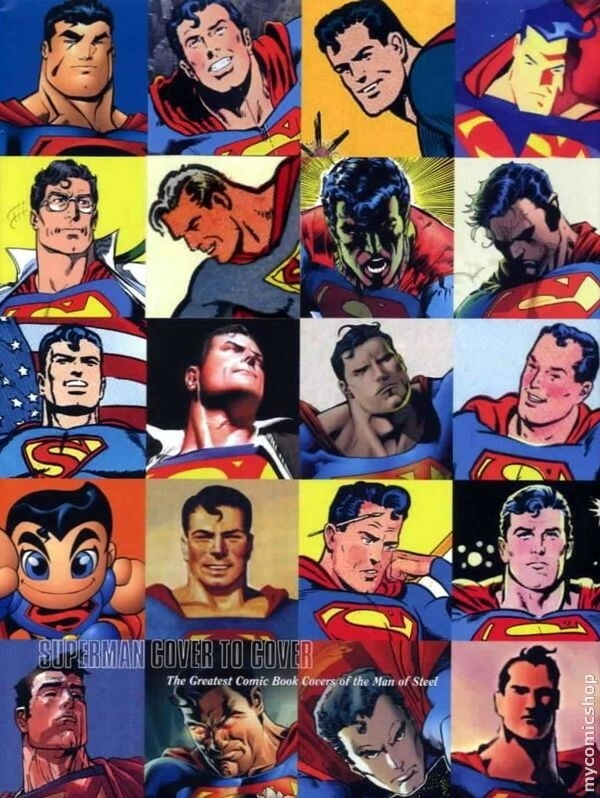 This book represents a diverse collection of cover art from Superman’s 70+ years of publication. They were chosen by an array of renowned writers, artists, and editors that have helped shape the storied career of the Man of Steel. Often times these covers are accompanied by personal recollections from those creators on why that particular cover gripped them as a reader or what the inspiration behind that cover was (if they drew it). 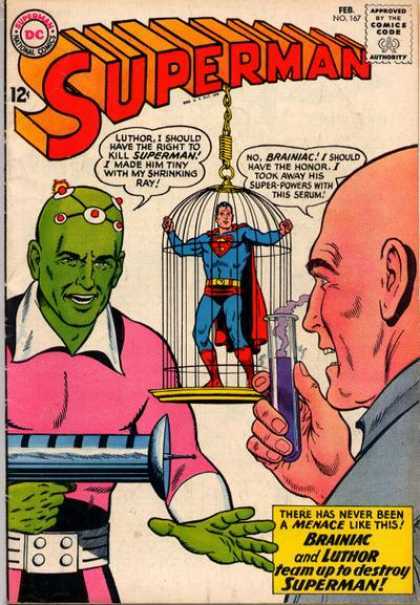 I found it interesting to note that probably more covers came from Golden and Silver Age eras than any other time period in Superman’s publishing history, a time full of whimsical stories accompanied by oftentimes silly cover art. The fascinating aspect of this book is witnessing the progression of comic book artwork since its inception, from the simplistic lines of the ’30’s and ’40’s to the realistic detail of the Modern Age. And in the process, this book reads as a Who’s Who of artistic talent, with the likes of Curt Swan, Neal Adams, George Perez, John Byrne, Alex Ross and Jim Lee featured in these pages (if you are not familiar with any of those names, I recommend that you rectify this woeful oversight immediately). Whether you are a Superman super-fan or merely have a passing interest in the Man of Tomorrow, I would recommend perusing page after page of phenomenal art. 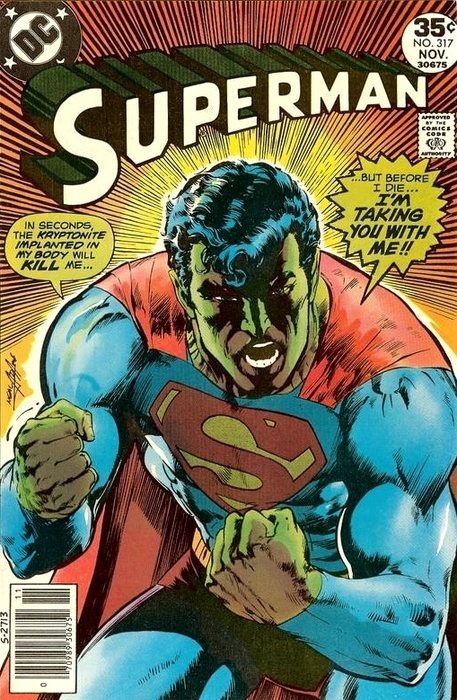 I will bid you adieu today with some of my favorite covers from the Superman gallery. 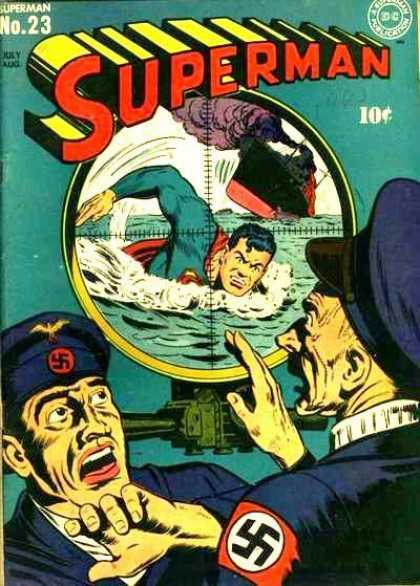 WWII Hero You gotta love the look of fear Supes strikes in the heart of these Nazi U-Boat commanders. 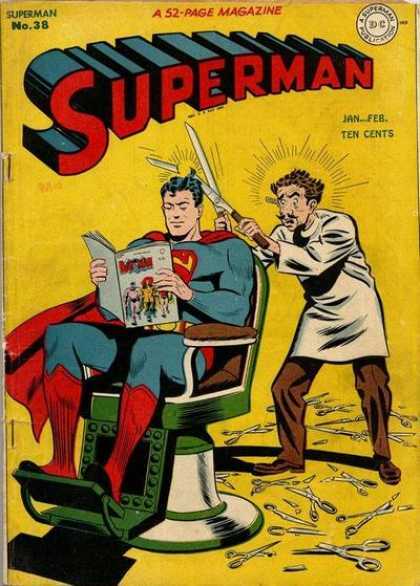 A Little Off the Top One of the sillier covers; for the barber’s sake, I hope Superman is a good tipper. Play Nice You Two This issue marks the first team-up between this villainous pair. 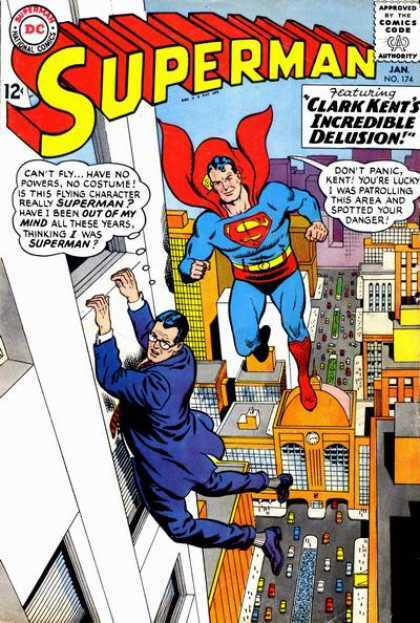 Schizophrenic Superman Looks like Clark Kent is having a mental breakdown here. The Power of Kryptonite Superman’s greatest weakness has entered the everyday English lexicon. The Iconic Pose I think this cover speaks for itself concerning its awesomeness. 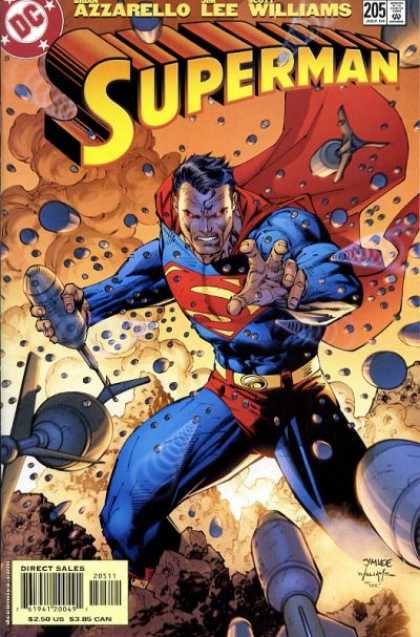 Bulletproof This cover sums it up best: nothing can stop the Man of Steel.